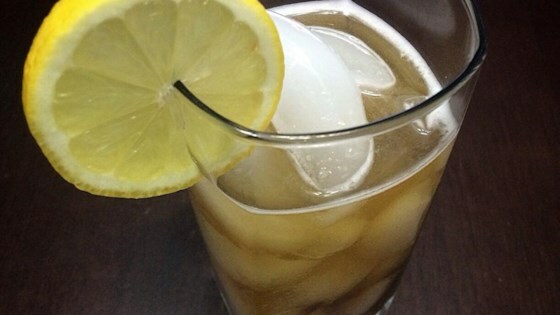 "There are a few impostors out there that claim to be Long Island Iced Teas. In actuality, there is only one correct way to make a LIIT... and this is it!" Fill a cocktail shaker with ice. Pour vodka, rum, gin, tequila, triple sec, and sour mix over ice; cover and shake. Pour cocktail into a Collins or hurricane glass; top with splash of cola for color. Garnish with a lemon slice. I will gladly verify that this is the original PROPER recipe for long island iced tea. As a bartender, I would add that instead of one fluid ounce of sweet and sour, fill your glass 2/3 of the way, then add a splash of Coke. Otherwise the ratio is off and it will be too strong. Yep! That's it. Pure and simple! This is the way to make a LIIT-Yum!